The enormous advances of the civil rights movement have made it easier for LGBT youth to be “out,” yet their increased visibility has led to myriad legal issues involving such critical matters as freedom of expression, sexual harassment, self-chosen medical care, and even their right to privacy within their own families. In this accessible guide, Lisa Keen illustrates how some laws limit the rights of LGBT youth and others protect them. 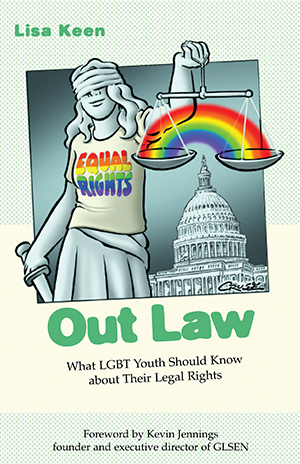 Out Law lays out the basics about federal, state, and local laws that frequently impact LGBT youth and explains how legal authority and responsibility is often vested in local officials, such as school principals. Keen explains how laws treating LGBT people differently came to exist, evolved over time, and are subject to significant changes even today. Out Law discusses the shifting legal terrain for such issues as when schools can censor messages on T-shirts or library computer research into LGBT-related Web sites. It gives youth tips on how to document efforts to curb their rights and where to turn for help in protecting those rights. “‘Beacon actually has, as a part of their mission, to work on social justice issues. So this very much fits into what Beacon is mandated to do. They have prioritized this,’ Bronski said.